I will give you my initial thoughts on the products and then review them as I use them. I have never heard of this brand before so I was very excited to try this out! This is a hydrating spray for the hair and for the skin which will be perfect for the summer days. I tried this on my face (are you meant to?) and it felt really light and was refreshing. It has no detectable scent to it either which is a bonus for me. It doesn't say whether it has any benefits for the hair or the skin but it seems to do what it says on the bottle. I am going on holiday in 3 weeks so I am saving this little bad boy for that. This is another brand I haven't really come across before. I am only just getting into my skincare so this is perfect for me. This gel promises to revive tired looking eyes, reduce puffiness and dark circles. I don't get puffiness as such but I am hoping this will help with my dark circles. I still need to use my Benefit eye cream, then the Clinique, Dior and Balance Me, so this probably won't be reviewed for a while. Again, another brand I have not heard of. I feel that GlossyBox are doing their job this month - introducing us to higher end brand products (I still shudder at the thought of the Collection eye liner I received a few months ago). This lip frosting smells devine!! However, that is where the positives kind of end - it is not very moisturising and it sits on your lips. I have had very dry lips these past few days so when I applied it, it just seemed to emphasise the chapped-ness (I know that sounds gruesome but I am being honest here). In future, I will make sure that my lips have been properly exfoliated before I apply this. You can also apply this on your cheeks but it is sheer and the colour pay off isn't that good - but then again I do have dark skin so it might work better on paler skin? This is a dry oil for the face, body and hair. I am new at the whole oil skin care and hair care products so I am not sure how to use this or what it does. I will probably youtube some vids and google some tips before I try this but I am very excited. Do you have any tips for me? 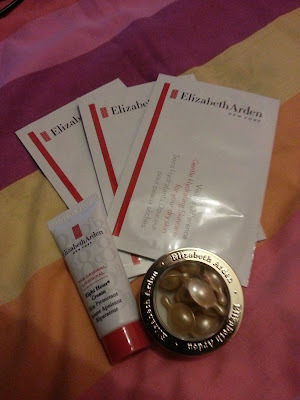 The generous sachet containing samples of the EA new skincare range more than made up for the little perfume disaster. I am a massive fan of EA skincare and I love their 8 hour cream. GlossyBox said that if we took the pamphlet containing the product info on it to an EA counter then we would get a free deluxe samples of their skincare range. Being a complete sucker for freebies, I drove to my local town centre in my lunch break today and went on the hunt for my free samples. Unfortunately, there were no 'deluxe samples' in the store (gutted!) but the sales laydee kindly gave me three more sachets of the skincare range, a deluxe sample of the 8 hour cream and some mini serum tablety things. I was rather pleased with what I managed to blag! Overall, I am very pleased with this box. I will stay subscribed for one more month to see what it is like next month and then I might pack it in. I am a graduate of the Paul Mitchell Cosmetology School in Virginia Beach, and I love all their products! The moisture mist is great as a detangler, I use it on my daughters hair. Its also great to use to seal in your makeup. It refreshes your face and hydrates that too! You should try their tea tree and awapuhi lines too!